Analogy: studying software execution artifacts and traces left in artefacts by software execution. Traces themselves may have undergone ageing, e.g. memory overwrites. 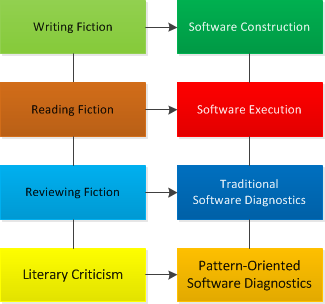 Root Cause Analysis uses mechanisms from Software Internals to understand causal connections and reconstruct original software execution context. Analogy: studying how code construction ideas are executed. Analogy: studying patterns across software execution artefacts such as software narratives (traces and logs) and memory snapshots.